So it is only fitting that when victors and vanquished meet to mark the centennial of the armistice this weekend, the biggest ceremony should be on the famed Champs-Elysees at the Arc de Triomphe. About 60 leaders will mark the cease-fire that came on the 11th hour of the 11th day of the 11th month of 1918. Such was the symbolic importance of the French capital that victorious U.S. Gen. John J. Pershing said it was his "desire that every man in the American Expeditionary Forces should be given the opportunity to visit Paris before returning to the United States." 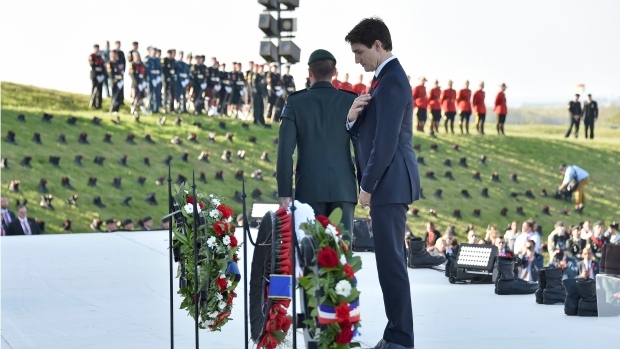 Far from every surviving U.S. soldier from the 1914-1918 war made it to the French capital, but on Sunday, President Donald Trump will join his French counterpart and host, Emmanuel Macron, and others to remember the millions who died during the first global conflict. Alan Seeger, the American poet that Macron lauded in his speech to the U.S. Congress last year, already captured the seeds of reconciliation in 1916 when he wrote, as a soldier in the French Foreign Legion, that "I never took arms out of any hatred against Germany or the Germans, but purely out of love for France." France, Britain and its empire, Russia and the United States had the main armies opposing a German-led coalition that also included the Austro-Hungarian and Ottoman empires. Nearly 10 million soldiers died, often in brutal trench warfare where poison gas added a cruelty in warfare that the world had never seen. Hundreds of thousands from all corners of the world died in Europe, many of them on the Western Front reaching from Belgium's Flanders Fields almost up to the Swiss border. Carrying the heritage of defeated Germany, Chancellor Angela Merkel will be visiting the site in the woods north of Paris where military leaders agreed in a train carriage to the armistice at 5 a.m. on Nov. 11, 1918, six hours before it took effect. On Sunday, in another show of reconciliation, Merkel will open an international peace forum in Paris with Macron and U.N. Secretary-General Antonio Guterres. Like other leaders visiting national cemeteries dotted around northern France, Trump will visit two burial sites that highlight how the United States came of age as a military power after it joined the war in 1917 and set it up to become a dominating force for the next century.